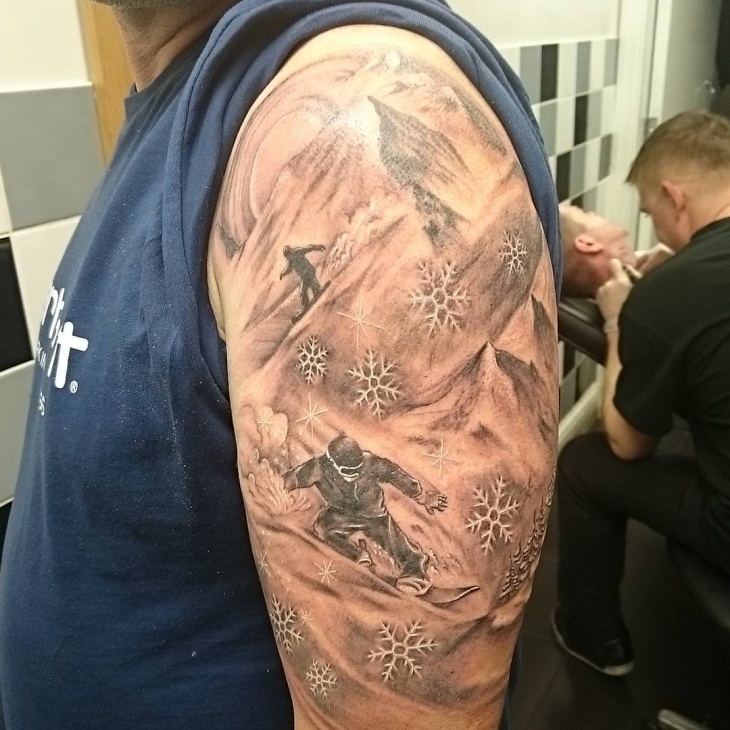 Get a landing of snowboard tattoos on your arms. 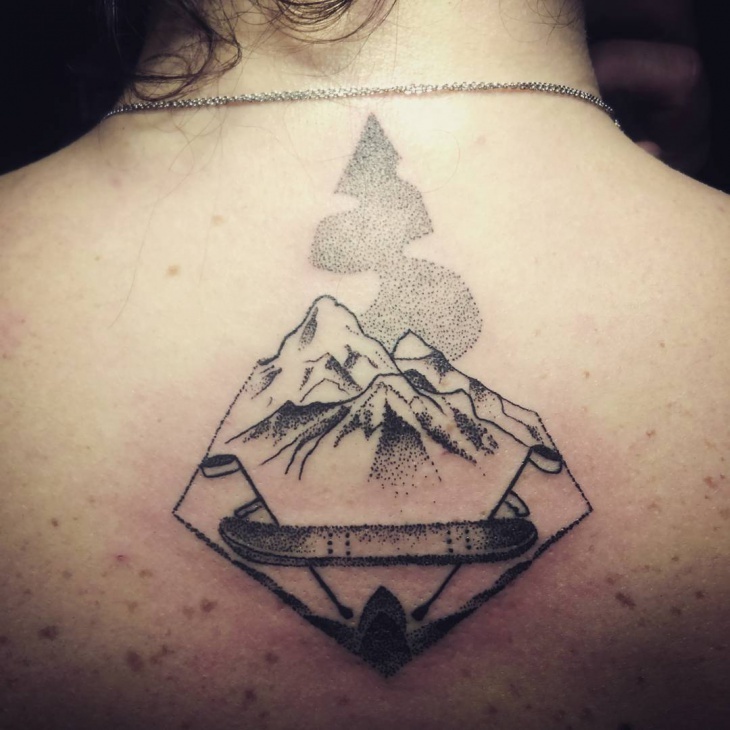 This is a unique tattoo design for the ski and snowboarding sports enthusiasts. You can get the shape of heart tattoos and place the motifs of snowboards and skiing in them. These are realistic and grunge looking motifs for tattoos. 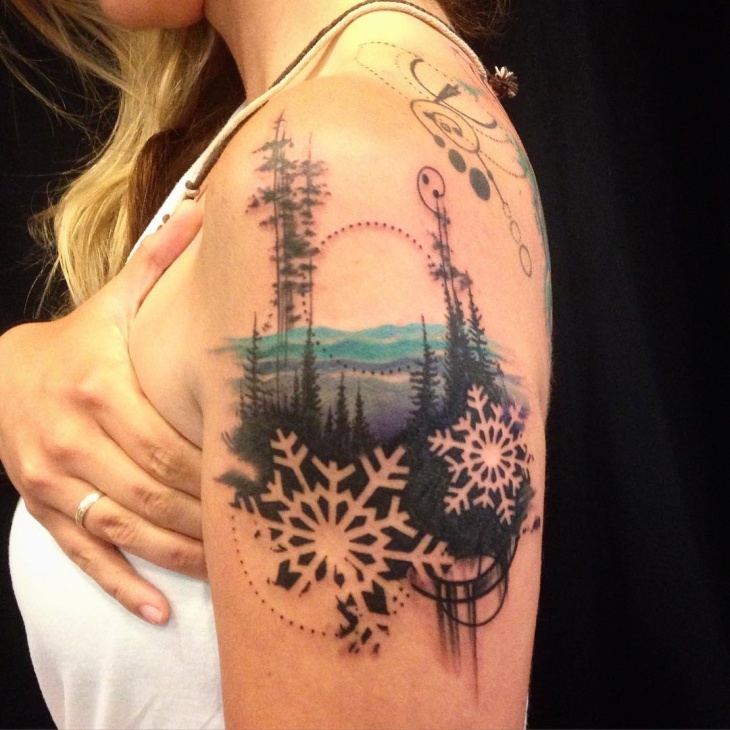 Get inked in the most original motifs that have mountains, snow, valleys, and other landscape elements in this design. Even bikers and rebels can try these tattoos on. 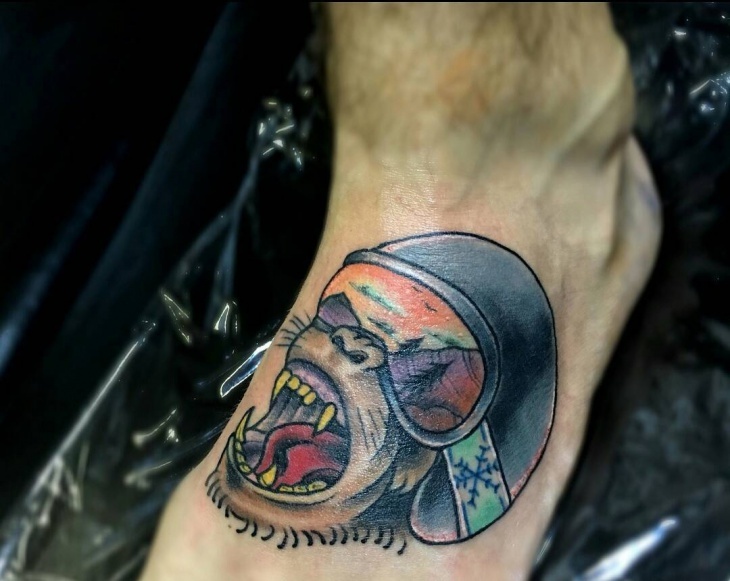 This is a tattoo of a man in a baseball cap with palms covering his lips. It is done in a single chocolate color. It has pine trees on the edge of the visage of the man. This tattoo design has a very high aesthetic sense and can be used by any many below thirty years of age. Snowboarders in black suits snowboarding are depicted in this design. It also has textures of snowflakes in white color and grunge background in black color alternatively. 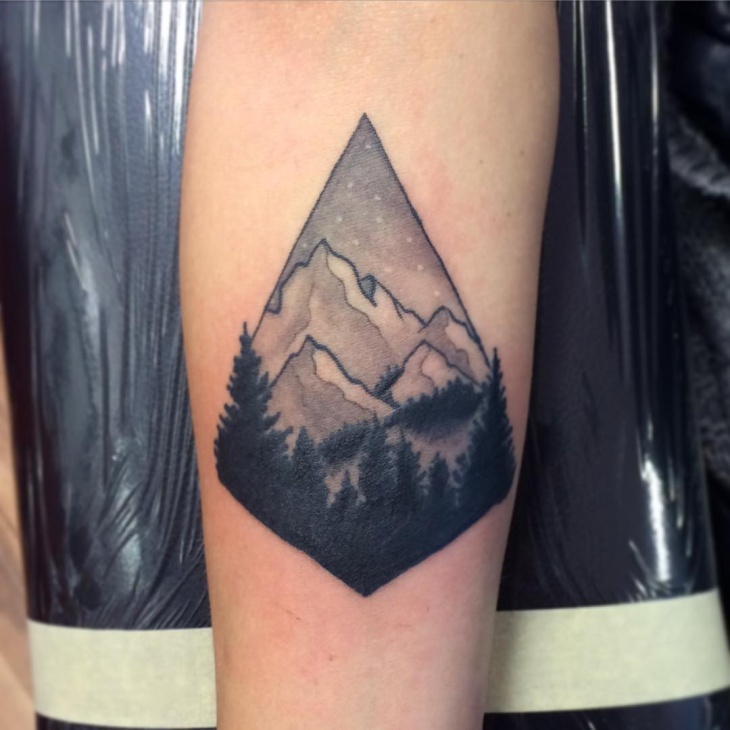 A few mountains in black are also drawn artistically. A beautiful mountain in a pyramid shape with green landscape border is shown in this design. 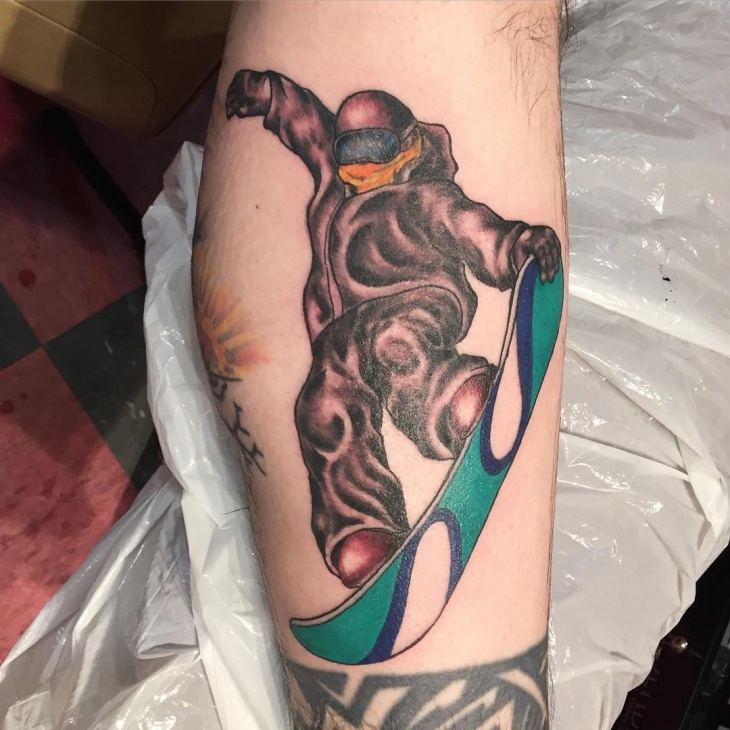 This is a highly artistic depiction of snowboarding that can be placed on the arm of a young man who loves adventurous sports. This is a colorful face of the chimpanzee with eyes drawn in the form of mountains. The head is covered with a helmet and also has the motif of snowflakes. 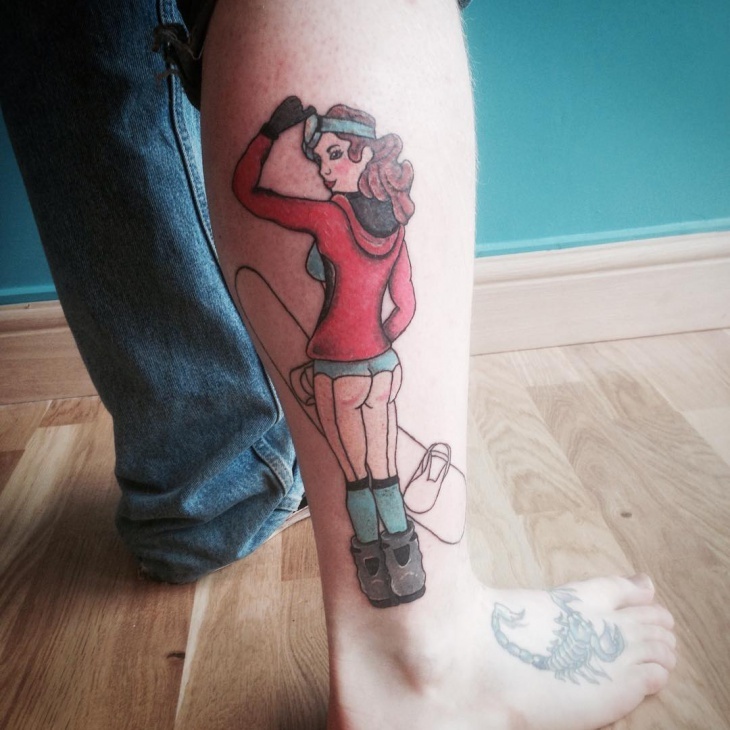 We suggest you try out this tattoo design on your feet. 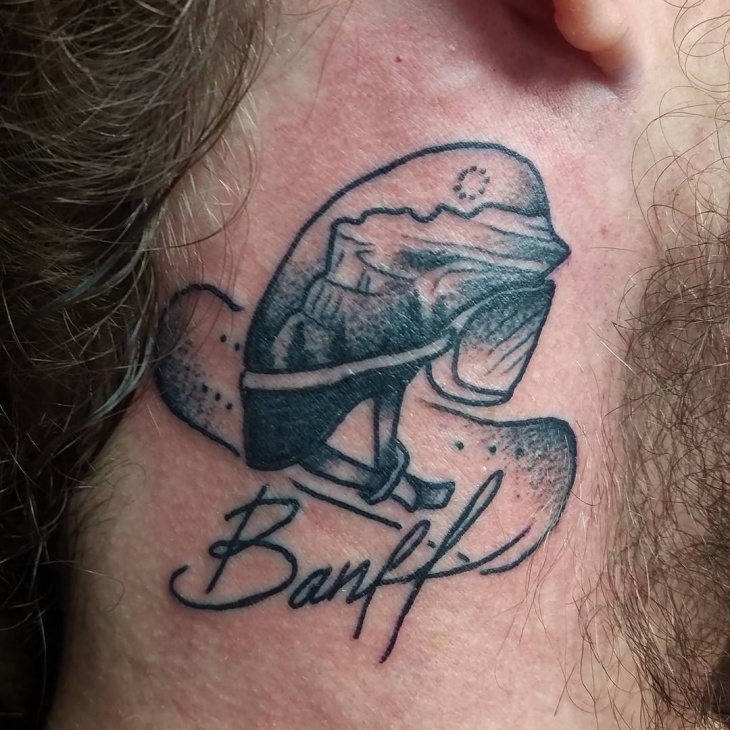 The shape of the tattoo is in the form of skiing goggles. The rest of the design of the Snow Mountains is placed inside the frame of the goggles. This is an innovative tattoo that young men can wear on their arms. You don’t have to be heavily built to carry this well. 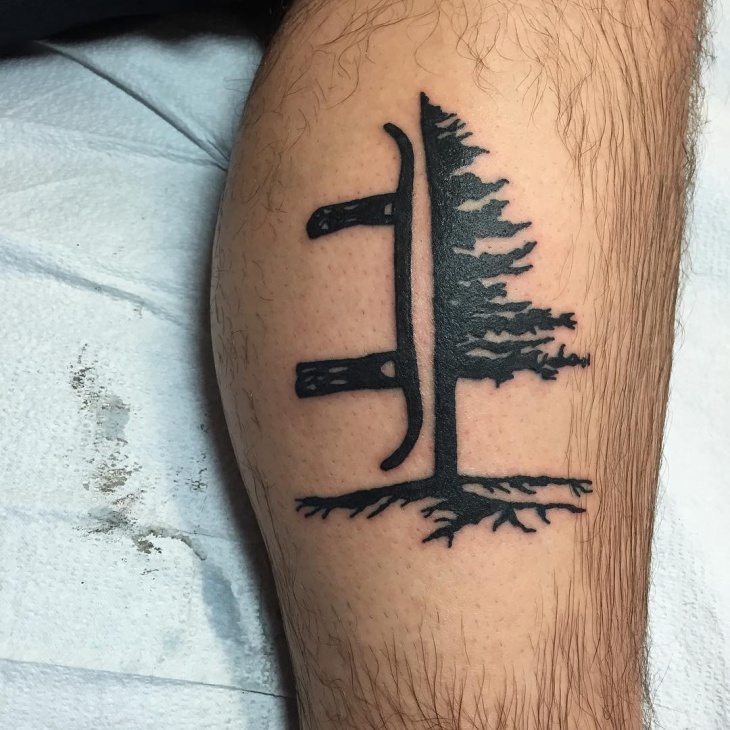 This is an atypical snowboard tattoo design done in black color. A man standing with his snowboard against the background of sun and mountains is depicted in this design. 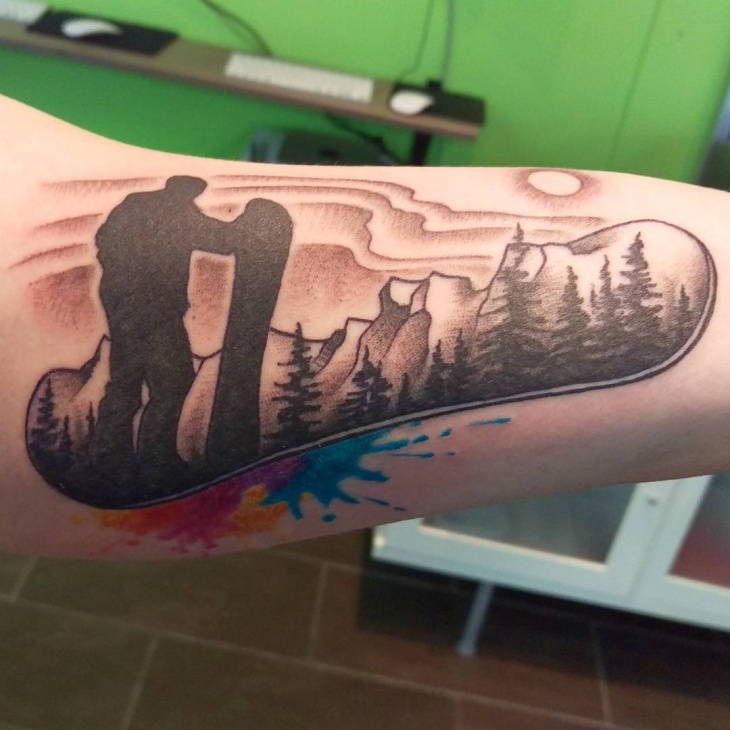 This is a large snowboard tattoo that can be done on the arms. 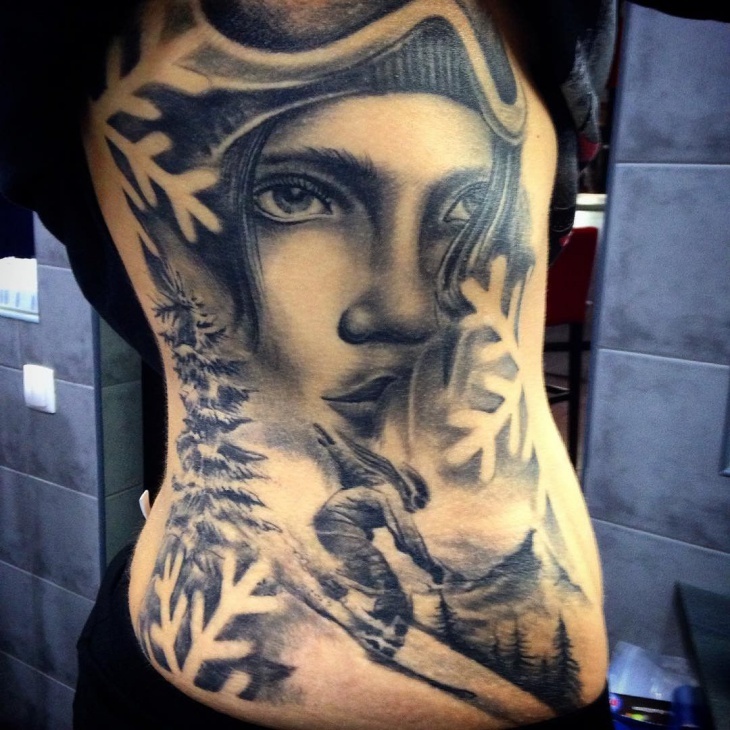 This is a pleasing and an elaborate banner tattoo design in snowboarding theme. 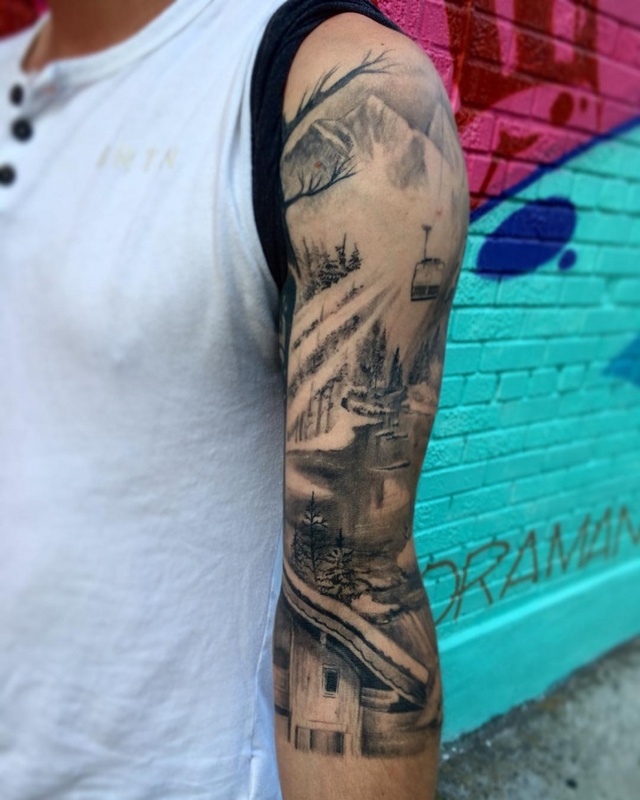 A valley of mountains with trees with a winter theme is done in this design. 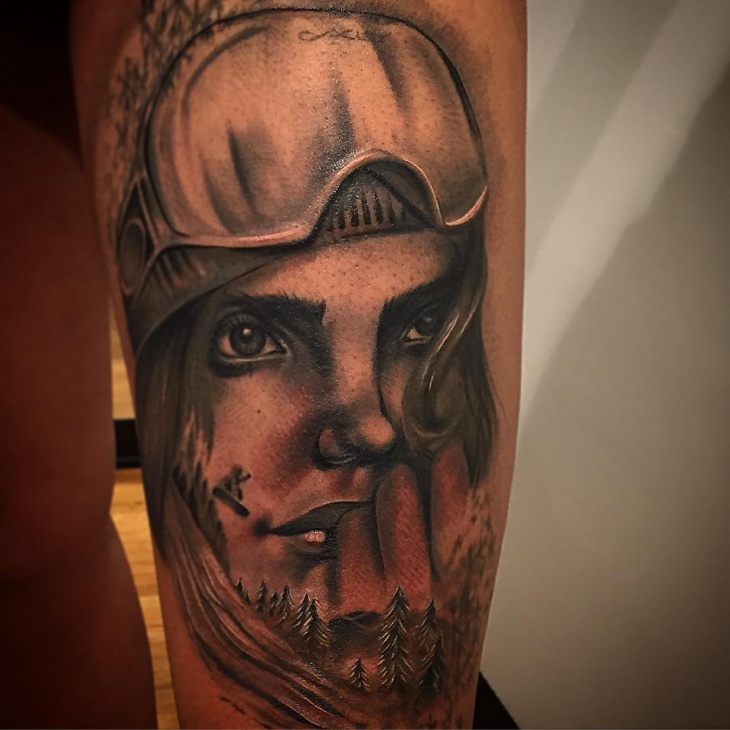 Even girls who love snowboarding can get this tattoo. 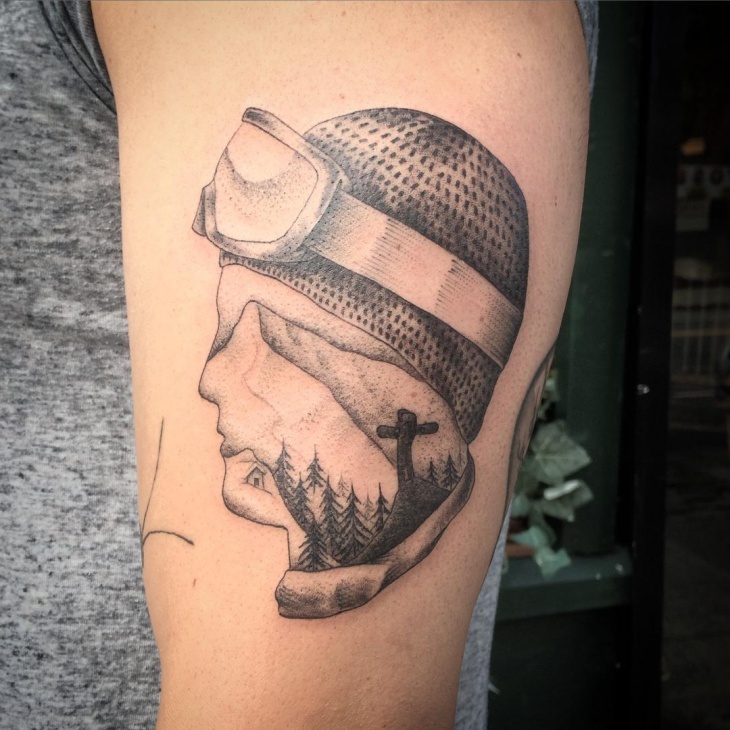 A visage of a man inside whose face all the snowboarding elements are placed in this tattoo design. It can also be passed off as a tribal tattoo. 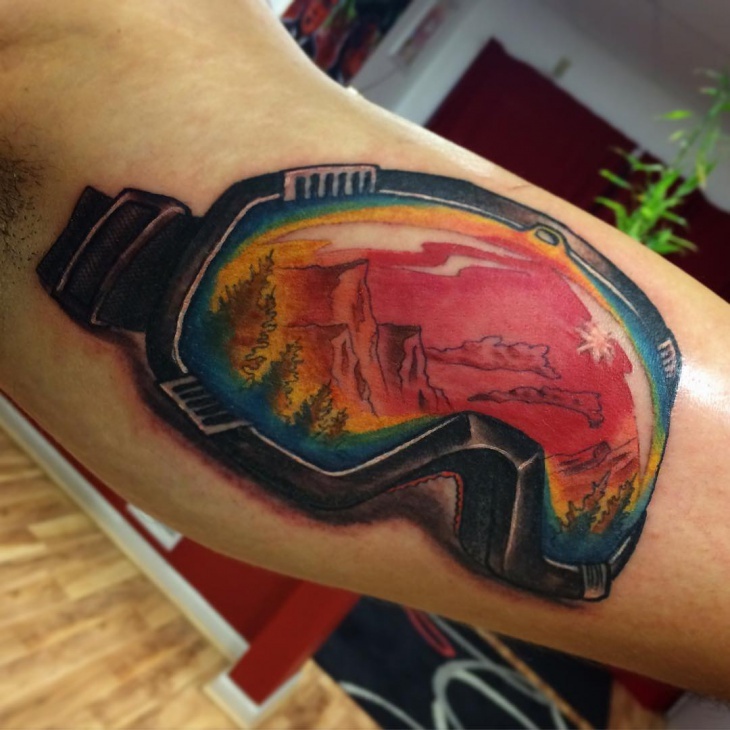 It has mountains, trees, and other elements placed inside the face of a man with a snowboarding helmet. 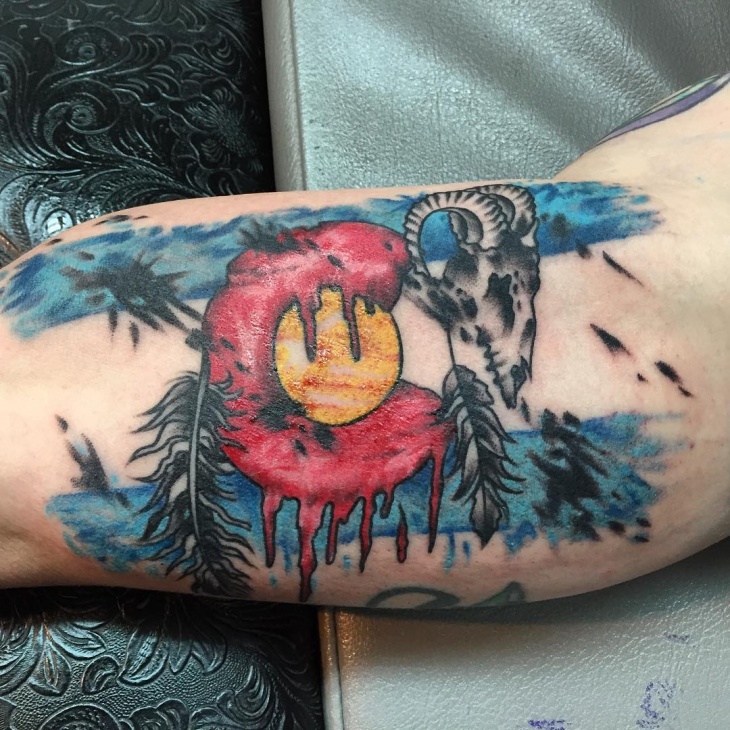 This is a snowboarding tattoo motif in blue, yellow, and red color. The trees covered with snow are colored in blue color. The sun is engulfed in a red color motif. This motif is slightly offensive. The sky is painted on the top and bottom of the motif in grunge style. An electric line is depicted in black ink. The snowboarder in his suit and snowboard is placed against the electrical lines. This gives a dynamic look and is suitable for rebellious men. There is more to tattoo designs than using the run of the mill motifs. 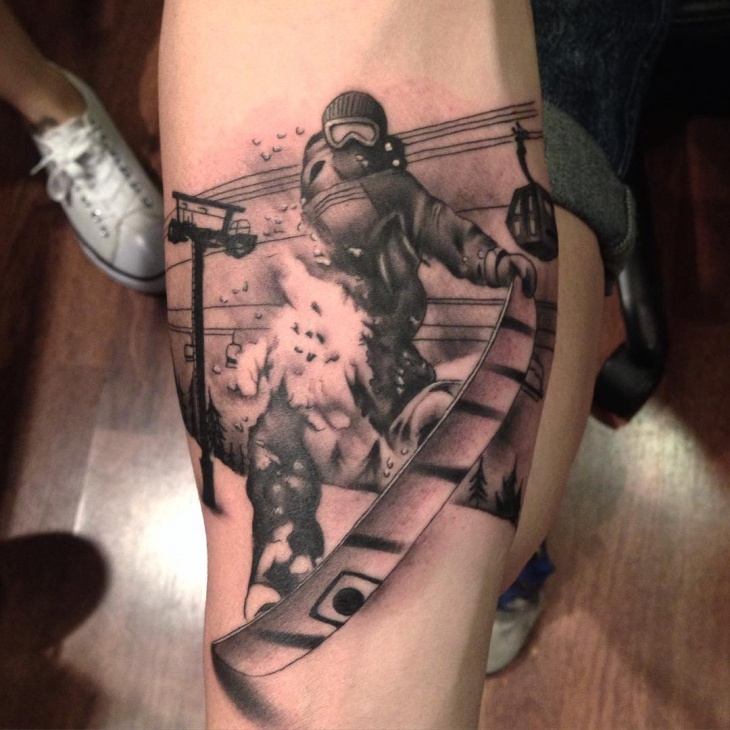 Right from snowboarding tattoos to mechanical tattoos, all are in vogue. Additionally, Polynesian tattoo with the intricate design done in black ink is a winner amongst men and women who love to get inked. They mostly carry the symbols of ‘tiki’ which is a tribal symbol.